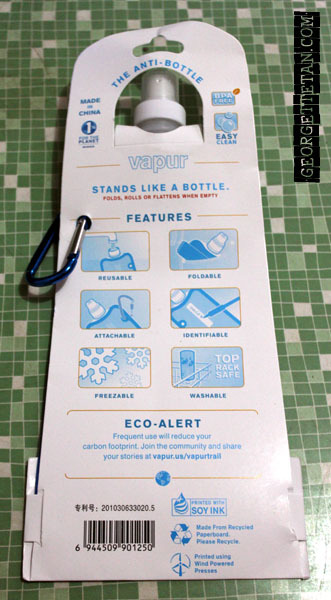 [Update, 10 June] I blogged about my experience with a real Vapur bottle here. You can also find out where you can get your own! This year, my mission is to travel more and travel lightly. I am envious at how some people can jump on the plane with one small backpack. I used to be able to do that, but I managed to fail rather spectacularly in my last one or two trips. 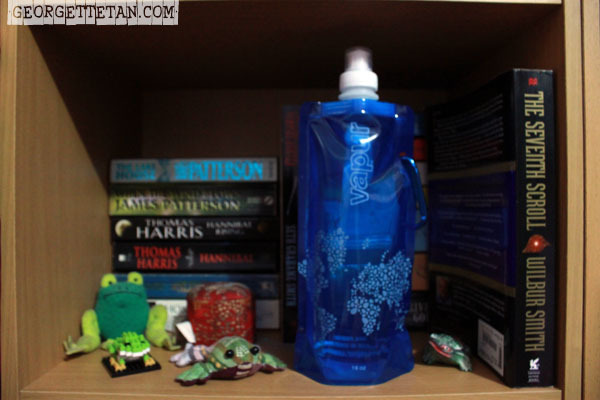 In an effort to put on a serious “I’m a minimalist traveller” face, I was reading blogs on travelling light when I came across Vapur, a reusable and foldable water bottle. Yeah, foldable. Like a tube of spent toothpaste or a Capri Sun drink pack. I love space saving and environment friendly ideas so I went about seeing how I can get one. 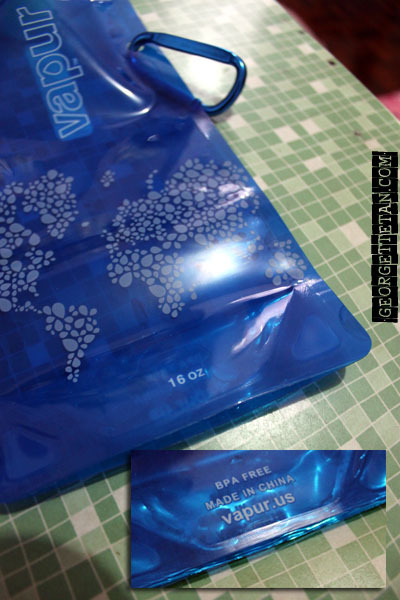 At USD9.99 (RM30.48), I thought it was a steal for such a great idea, but international shipping was nearly USD30! Uh, guess not! But I couldn’t get it out of my mind so I searched around to see if there was a stockist in KL or Singapore. And guess what? I found a seller in KL via an online marketplace. The seller was using the photos from the official Vapur site but the price was suspiciously low – RM9. I figured it can’t hurt to take a look at one, so I ordered it and it arrived today. It looked like the real thing but there was a couple of obvious giveaways to suggest that it isn’t. 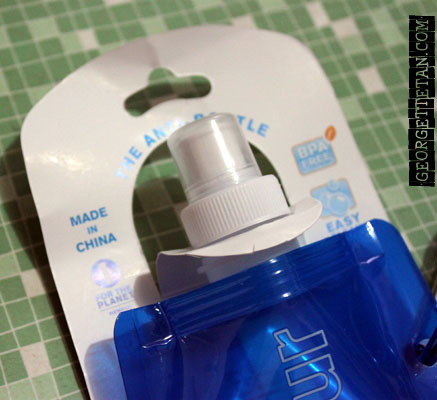 They must have copied the packaging exactly, except for where they added the ‘Made in China’ and a barcode at the bottom. The language is disappointingly Engrish-free. They even left the URL to the official site intact. I’m also pretty sure China didn’t print it with soy ink or use wind powered presses to do it. Let’s take a closer look at the Chinese knockoff. The bottle was delivered flat. The front bottom said that it has a 16oz capacity (Vapur official site sells 14oz and 18oz). I’m going to take the ‘BPA Free’ notice as part of the design that was ripped off and not as a claim of quality. It folds and tucks into the carabiner, which is pretty neat. You can use the carabiner to hook the bottle to your bag. Here’s a closer look at the bottle cap. 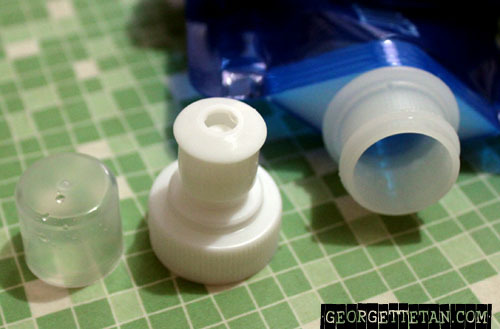 At first handling, you can already tell this plastic is no better than the ones used for dishwashing liquid bottles. You have to squeeze the bottle into shape to make sure you’re filling it up to full capacity. Then it stands up, which is pretty cool considering it was delivered in an envelope. It’s pretty fun to drink from what’s essentially a super squeezy bottle. I’m not sure if there is an official retailer in Malaysia, since all I can find online are dodgy forum and blog posts that are probably selling the same thing I got. The nearest place we can get the real deal appears to be Singapore. Someone in a forum somewhere pointed out that Platypus carries something similar and for a slightly cheaper price. For those of us in Malaysia, Tiny Tapir carries this version of the soft bottle. You can get it with a holster, which I find pretty attractive in a juvenile way. 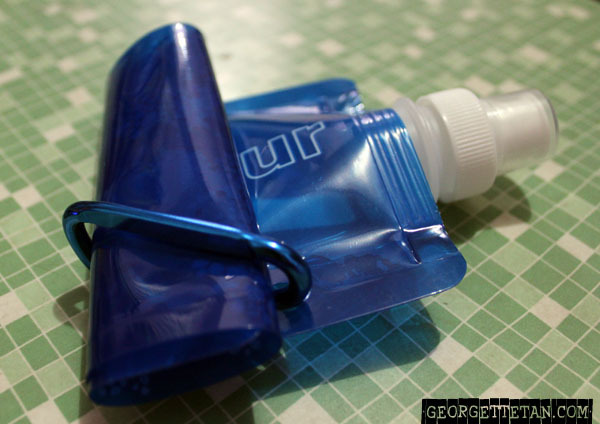 A holster for a water gun… teehee! I’m gonna try this fake Vapur and see how I like using soft bottles. I’ve never considered anything more complicated than metal water bottles but I never bring those when travelling. Next, the search for a good microfibre towel! 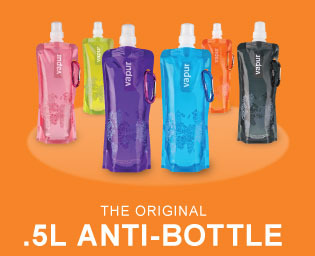 If you want to travel light, a water bottle may be the least of your worries regarding weight and size. You can always buy bottles of water where you travel to and throw the empty bottles into recycle bins … no? I get 330ml bottles cuz I can usually find places with drinking water to refill the bottle. And I end up keeping the bottles cuz their designs have been quite cute and unique. I carry too many gadgets when I travel – my netbook, charger and extra battery, handphone and charger, camera and charger, external hard disk, hair dryer, umbrella … I even found a RM10/- tiny iron cuz I dislike creases on my T-shirts. What would be nice would be a universal charger, something like a central dock with different sizes of plug points, like an international adapter. hi..i am from malaysia too..
can i know which website u get this? i’m looking for it long time. Hello Shan. It’s actually quite easy to find if you Google it. There’s actually more places to buy it from now than when I first looked, so you can choose where you get it. We actually contacted Vapur in 2009 when they first started up biz, but they haven’t been ready to start international distribution yet. To Chet – check this out about why we should all avoid bottled water : http://vapur.us/why-vapur – actually the flat reusable bottles are also perfect for using on airplanes too, especially on long flights (i hate those little cups of water and inevitably we don’t drink enough water on planes). Disposable water bottles are also not BPA free generally and the water usually tastes funny in them if the bottles have been left in cars etc. Hope you’re enjoying your foldable bottle regardless! 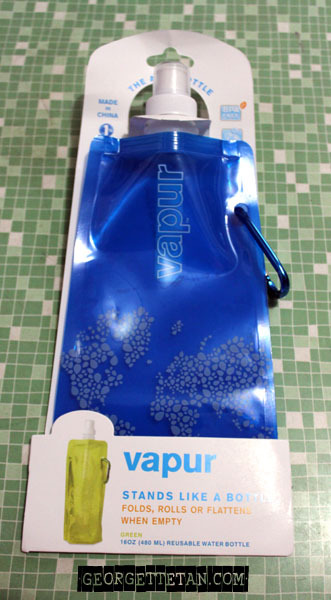 I bought the Platypus bottles on ebay but recently found the Vapur bottle at Isetan in Singapore. I was so surprised to found them there because Isetan is a pretty big Japanese department store stocking good quality merchandise but after a closer look back home I also noticed the poor quality and spotted the differences between the genuine Vapur bottles online. The fake Vapur bottle quality is almost like the disposable ribena packs you buy from 7-11 but I’ll give it a try; or use it to hold water for other purposes. My fake one is now my ice pack. :) I put some water in it and freeze it flat. Then I slip it into my thermal lunch bag. Keeps the cold sandwiches and salads cold. can u tell me in which web site did you buy it? cuz i’ve been looking and the payment generally is with western union, moneygram, etc, so i’m not sure about it, is it trustable? I got myself a genuine Vapur a few weeks ago and have yet to blog about it. But I’m enjoying it! My friend in Singapore just became an authorised dealer and she’s willing to ship to Malaysia. If you like, I can make introductions. Vapur is now in Malaysia and distributed by Signature Identity Profile SB. We have currently distributed the product to Ampang Outdoor Center & Tomi Convenience. Will soon launch at ISetan KLCC. You can log on to Tomi Convenience, Facebook to check on the product range & prices too.